First flight 1989. 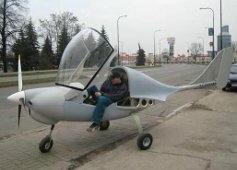 Strutted highwing one-seater from aluminum alloy tubes with fabric covered wings and empenage and pusher Rotax 447 engine. Cruise speed 80-120 km/hod, stall speed 45km/hod, needed airstrip for RC models. First flight 1993. 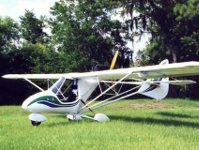 Strutted highwing with aluminum alloy airframe and composite side-by-side canopy with pusher Rotax 462 - 912ULS engine. Cruise speed 140-160 km/hod. 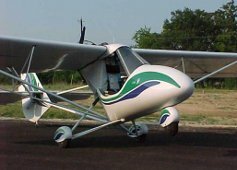 Interplane sro and Skyboy rights are actually for sale. 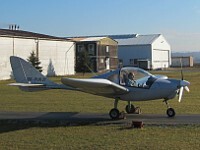 First flight 2004. All-metal strutted higwing with empty weight under 300kg by calculated and tested MTOW 600kg. 1,17m wide cockpit with forward opened large doors. Rotax 912S engine is pushing MD3 to max. level speed 222 km/hod, cruise speed by 75% rpm 200km/hour . 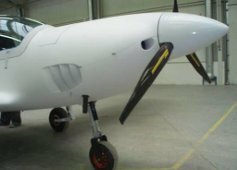 Producer: Aerospool CZ, Gryf Aircraft sro, Flyitalia, Next Aircraft (since 2011) | 50+ produced. 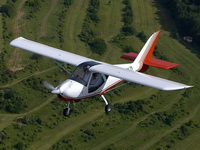 Two-seat light sport aircraft, designed to be ideal for cross-country flying - with easy access and extremely wide outlook, enabling feeling wings are not divided part of pilot-aircraft complex. Cruise speed 180-220 km/hour. Proof of concept Gryf P27 flying. Looking for serial producer. 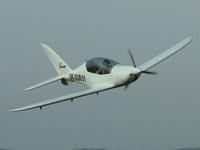 Composite high-performance UL tandem-seat low-wing with retractable undercarriage, optimized for long cross-country flights with cruise speed above 260 km/hour, flying 297 km/hour by max continuous rpm. Empty weight incl. 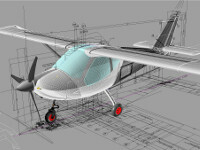 rescue system under 295 kg, calculated and tested for 600kg MTOW = UL, LSA and ELA version with identical airframe. Producer: Shark.aero s.r.o. | LAA and Germany type certification. 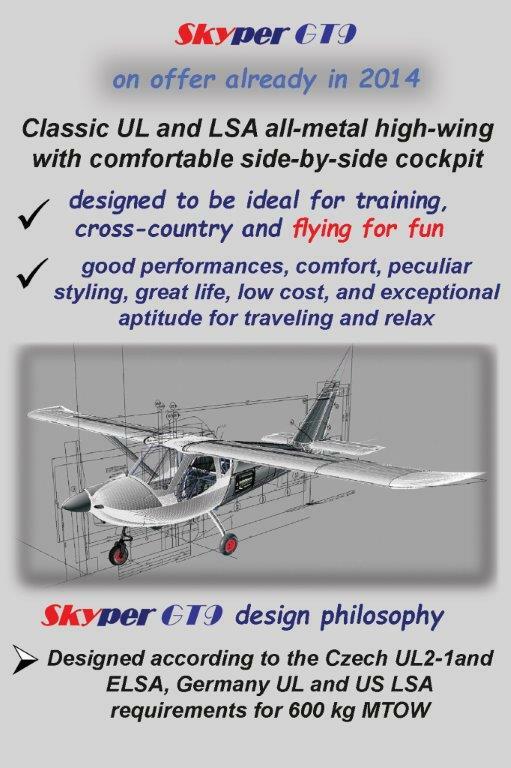 MD9 was designed and calculated to be more comfortable follower of MD3, using large 3D windshield, wider cockpit ( 1,2 m ), independent large baggage compartment, and a lot of next improvement , to cover needs of customers, trying to find the best UL or LSA all-metal high-wing with comfortable side-by-side cockpit : ideal for cross country and flying for fun. 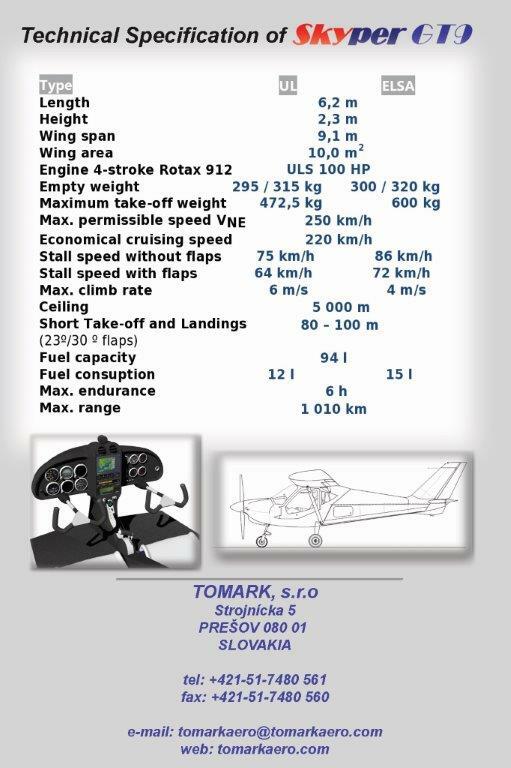 Slovakian TOMARK sro company adapted that design to be more in agreement with their company accessible technologies and experiences - and offers that design under their name Tomark Skyper GT9. 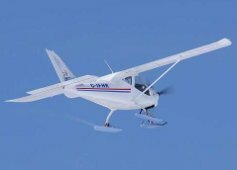 Designed according to the Czech UL2-1 and ELSA, Germany UL and US LSA requirements for 600 kg MTOW.